It starts out as a vastly familiar story. As the industrial economy grew and manufacturing jobs moved to the outskirts, many of Wichita, Kansas’ historic downtown buildings were boarded up, with vacancy rates up to 70%. Now an evolution to a knowledge-based economy is bringing people back to the city center, and as we know, the creatives will seek out the natural cultural districts first. The premiere natural cultural district in Wichita (which may surprise you in that it’s the 51st largest city in the U.S.) is Old Town, the historic downtown district spanning 20 blocks of brick-lined streets. What was once the aforementioned abandoned zone of buildings is today the downtown’s hot spot, with public plazas and loft residences (pictured), vibrant street life and bustling restaurants and nightlife venues. Following the successful formula of starting with restaurants first, the city then enacted a TIF district to re-invest taxes back into the sources that generated them, followed by a partnership with the county to invest $4 million for street improvements, brick paving, boardwalk preservation and the restoration of the building for the new farmer’s market. 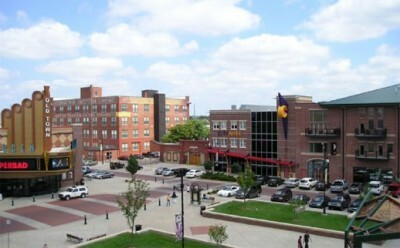 This also included two large public plazas for civic events and social networking. Housing developers followed with the first mixed-use residential loft development in Old Town, Mosley Street Place, then spurring 40 condominiums, 160 apartment conversions, more than half of which were attainably priced, a restoration of what is now the Hotel Old Town and the Old Town Warren Theatre, and an Old Town Square Addition (pictured) featuring mixed-use buildings with shops, offices, apartments, green public space, a splash park, a new CityArts gallery… you get the idea. Image: Old Town Plaza, Wichita, Kansas by Keith Wondra.